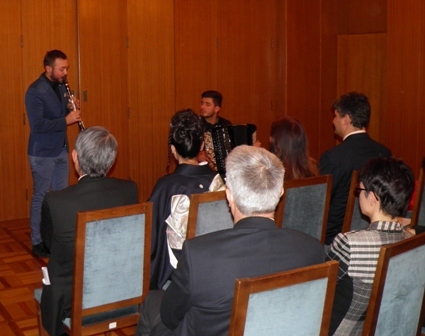 On December 15th, 2015, in the Embassy was held the New Year’s concert performed by the Duo „Seraroma“, with Rade Mijatovic on the аccordion and Daniel Emanuel Andreiscu on the clarinet. The Duo was formed in Bern with the idea of spreading the music of the countries they are originally from (Serbia and Romania). They performed in almost every auditorium in the Canton of Bern with notable concerts also in Zurich, Basel, Lucerne and in other cities in Switzerland. Duo ''Seraroma'' played music from Serbia, Balkans and Eastern Europe in front of 60 attendees from the Swiss Federal Department of Foreign Affairs, diplomatic corps and the Serbian diaspora. At the beginning of the concert the Ambassador Dr. S. Jankovic thanked the participants for their support and cooperation during this year and wished them happiness and success in 2016, with the hope to continue the fruitful cooperation in the future.